A team from the International Criminal Court (ICC) is expected in the Palestinian territories as well as in Israel to discuss with leaders on both sides and to educate populations on the court’s work, two years after the Gaza-Israel war. 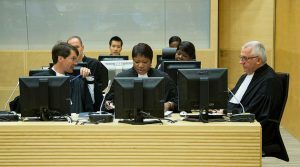 The team, not including the court’s head, Chief Prosecutor Fatou Bensouda, bashed expectations that it would start investigations of the 2014 war between Hamas in Gaza and Israel. The trip, according to Bensouda, was “not linked” to her preliminary investigation into the war launched last year. It is the first time an ICC team visits the conflict zone since the 2014 war, which caused death of more than 2,200 Palestinians including 551 children, and the death of 76 Israelis mostly soldiers. The team will visit Tel Aviv, Jerusalem and Ramallah but will not travel to Gaza where Israel has been accused of war crimes. The team will hold talks with both Israeli and Palestinian officials and will organize working sessions to educate people on both sides on the work of Hague-based court. The delegation “will not engage in evidence collection in relation to any alleged crimes,” Bensouda pointed out. Last year, Palestinians submitted a demand asking ICC to investigate war crimes committed by Israel in Gaza during the 50-day war. Israel; not a party of the court, lashed out at the Palestinian demand but accepted to cooperate with the court. Israel also accused Hamas of war crimes for firing rockets on Israeli civilian neighborhood. Written by: Peter Mulvany on October 6, 2016. Posted by Peter Mulvany on Oct 6 2016. Filed under Headlines, World News. You can follow any responses to this entry through the RSS 2.0. Both comments and pings are currently closed.